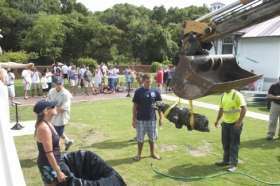 Cannons retrieved from mystery ship off St. Augustine. 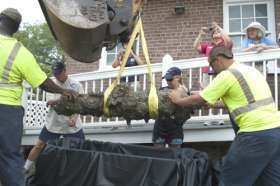 Lowering the cannon into a tub of fresh water to start the restoration process. 17th Century Inventory. Part One. An Appraisemt of the estate of Mr Jonathan Newell late of York psh & County Mercht decd taken in Obedience to an order of yorke County Court bearing Test at yorke ffebruary the 29th Ao 1671/2 By Mr John Smith Mr Edward Moss Mr John Hothersall and Mr Willm Paddison being first Sworne By Capt John Scarsbrooke one of his Mas Justices of the peace of the said County. 18th Century Cloth Fabric Terminology. Any person that has accasion to have any Linnen Cloth made into Buckram, or to buy buckram ready made, or Callendring any Silk, Watering, Dyeing or Scouring; they may apply themselves to Samuel Hall, lately from London, and Thomas Webber near the New North Brick Meeting House, or at their Work-House near the Bowling Green, Boston. ALEPINE: (alapine, alpine) French word for Bombazine, dress material first made entirely of silk but later of silk and cotton. BAISE: coarse woolen used especially for work clothes. BANDANNA: richly coloured silk handkerchief with spots left white or yellow; also a cotton of similar pattern. BASKET CLOTH: woolen characterized by small squares produced by the weave. BAPTISTE: fine white linen of French or Flemish manufacture, much used for neckwear. BEAVER CLOTH: heavily napped fabric in imitation of beaver fur used for coats and scarves. BENGAL: light thin cloth made of silk and hair. BIRD'S EYE STUFF: cotton or linen marked or spotted as if with bird's eyes. BLANKET: any thick, heavy wool, cotton or combination wool and cotton, with a short nap on both sides; often a white or undyed woolen stuff used for clothing. BLONE LACE: (blonde) a white silk pillow lace. BROAD CLOTH: soft lustrous woolen with nap sheared close and pressed; also a fine, smooth surfaced cotton or silk. BUCKRAM: coarse linen stiffened with gum or paste and used for linings. BUNT: open-made worsted or cotton for flags. CALENDAR: machine and rollers to press cloth to smooth or glaze or to give it a wavy appearance. CALICO: cotton imported from Calicut, India, generally imported in natural color. CALLAMANCO: plain or patterned woolen of Flemish or English manufacture, sometimes part silk or goat hair. CAMBRIC: fine, thin white linen made in Cambrai, Flanders; also an imitation made from closely woven cotton. CAMLET, CAMBLET: originally a costly fabric made from camel hair or angora wool; also a wide variety of similar cloth made from silk, wool, or combinations of fibres; camlets were characterized by silky texture and were often watered. CASHMERE: the fine wool found beneath the hair of the goats of Kashir and Tibet; a soft twill fabric or shawl made from this. CASSIMERE: medium weight woolen of soft texture used especially for men's clothing. CHEVIOT: woolen named for Scottish sheep - cloth has a hairy nap. CHEVRETTE: thin goatskin used for gloves. CHIP HATS: those made from wood or woody fibres split into thin strips. CLOCK: ornamental pattern in silk thread worked on the side of a stocking or other garment. DUCK: strong, untwilled linen or cotton, lighter and finer than canvas. Russian duck is coarse, heavy and unbleached but softer than English duck. DUFFELS: coarse woolen with thick nap or frieze. DURANT: thick, heavily felted woolen made to imitate buff leather also called Everlasting. FELT: fabric of wool or wool and fur or hair, made by beating and rolling the fibers under moist heat; used not only in hats but if especially heavy, in carpets. FERRET: strong tape of cotton or silk. FLANNEL: loosely woven, lightweight woolen with slight nap. FLORINTINE: rough material made from wild as opposed to cultivated silk, for curtains and parasols. FRIEZE: coarse woolen with nap usually on one side only; cloth with looped pile. FUSTIANS: coarse cloth of cotton and flax, thick twilled cotton with short nap. GAUZE: thin transparent fabrics of silk, linen or cotton. GIMP: In lace-making gimp is a coarse thread which forms the outline of the design; in curtains or furniture trimming gimp is a narrow band usually of silk or worsted with a cord running through it. GROSGRAIN: (program) a coarse fabric of silk, of mohair and wool, or of these mixed with silk and often stiffened with gum; a particularly thick taffeta. HOLLAND: a closely woven white linen used especially for shirts and bed linen. HUCKABUCK: a stout linen fabric with the weft threads thrown up to form a rough surface; used especially for towels. HUM-HUM: a coarse cotton of Indian origin used for lining coats. JEAN: a stout twilled cotton cloth. KENTING: a kind of fine linen named for its place of manufacture, the County of Kent. KERSEY (karsey): a kind of coarse woolen cloth made chiefly in Kent and Devonshire. LAWN: a kind of fine, thin linen of open texture. LEVERET: the fur of a young rabbit. LINSEY: probably short for linsey-woolsey; a coarse cloth made of linen and wool. LUNGI (lungee): a fabric of Indian origin made with richly colored silk and cotton. LUSTRING (lutestring): a soft silk which might be either plain or flowered. MOHAIR: yarn made from the hair of the Angorra goat; a fine camlet made from that yarn; imitations of the yarn or cloth. MOREEN: a strong woolen or woolen and cotton material, often watered, used for curtains and in upholstery. MUFFETEE: a muffler worn around the neck or a worsted cuff worn on the wrist. MUSLIN: a general name for the most delicately woven cotton fabrics, especially those used for ladies dresses, curtains, etc. NANKEEN: a sturdy brownish-yellow cloth produced in Nanking; imitations of that cloth. OSNABURG (osnabrig): a coarse heavy linen made originally in Osnaburg, Germany, and used most often for sacking and bagging. PADUASOY (paduasways, padersoy): a strong, corded or gros-grain silk worn by both sexes; made originally in Padua. PEELING (pealong): a thin skin of fabric used as dress material. PENCIL CALICO: that to which dye has been applied with an artists pencil (a brush designed for fine, delicate work). PENISTONE (pennystone): a coarse woolen named for a town in Yorkshire, used for garments, linings. PILLOWS (pilloes): a kind of coarse fustian. POPLIN: a ribbed dress fabric made of wool, silk and wool, cotton and wool, or other combinations; it is distinguished by fine warp yarns which cover completely the coarser yarns of the woof which form the ribs; the highly regarded Irish poplin was made of silk and wool. PRINCES: a corded linen cloth. PRUNELLA (prunellos): a strong fabric made from silk but later of worsted and used for men's gowns or later for the upper portions of women's shoes. RATTEEN: a thick twilled woolen usually friezed or with a curled nap, but sometimes dressed similar to frieze. SAGATHY: a light woolen stuff, a kind or serge or ratteen, sometimes mixed with a little silk. SARSENET: a very fine and soft silk material made both plain and twilled in various colors and used especially for linings and ribbons. SATIN: a silk fabric with a glossy surface, imitations of that cloth. SATEEN: a cotton imitation of satin. SERGE: a woolen fabric, a durable twilled cloth of wool or silk and wool. SHAG: a worsted or silk cloth with a velvet nap, same as duffel. SHALLOON: a closely woven woolen used chiefly for linings. SHEETING: strong linen or cotton cloth used for bed linen. SILESIAS: thin but coarse linen from Silesia, used for the backs of vests and for other clothing, also a cotton imitation. SKEIN: a quantity of thread or yarn wound to a certain length on a reel; a skein of cotton is eighty turns of the thread on a reel 54 inches in circumference; the definition varies with other fibers. STUFF: any woven textile, but especially woollen cloths without a nap. SWANSKIN: a fine thick kind of flannel. TAFFETA: a light thin silk of high luster used especially as a dress fabric. TAMMY: a fine worsted cloth often glazed and usually highly colored. THICKSET: a strong twilled cotton cloth with a very close nap, a kind of fustian. TICK: a strong linen or cotton fabric woven in stripes and often in herringbone weave; it was used for upholstery and bedding. VELVERET: a variety of fustian with a velvet surface. VELVET: a silk fabric with a thick soft pile of short erect threads; sometimes a similar woolen cloth. VELVETEEN: cotton imitation of velvet. WILDBORE: a strong, closely woven, unglazed tammy. WORSTED: a woolen fabric made from well-twisted yarn spun of long staple wool combed to lay the fibers parallel; also the yarn of which such cloth was made. Do you know how sunflower seeds were dehulled in the 18th century or earlier by woodland Indians and or colonials? "The sunflower...was frequently cultivated, either together with corn and beans, or in patches by itself, and furnished an oil which was highly esteemed. The Hurons and Iroquois generally are said to have sown but little of it, though they made from it and oil 'to annoint themselves.' The Indians of Virginia made of it 'both a kinde of bread and broth.' The oil was said, by a Mohawk informant, to have been made by roasting the seeds slightly, then pounding them in mortar, after which the material was boiled and the oil skimmed off. The oil, at present, is used principally for ceremonial purposes, such as the anointing of the masks used by the False-face society. It was also stated by Chief Gibson to be good for the hair and to prevent it from falling out or changing colour." [sunflower] From its seeds a kind of bread and also a broth are made." meal except in the condition of paste. As such, however, they were formed with the fingers into little patti-cakes which, laid on leaves, or hardened by roasting deep buried in the ashes, were eaten with other food in the place of meat, supplying the lack of the latter, at least to the taste, most admirably." Colonial Settlers Travel 4. Tools & Hardware. So what tools should you take with you when settling your own place? I have often thought about the post & beam dwellings with wattle & daub walls. Digging post holes is not that hard when using a crow bar & a post hole shovel, but how did the early settlers do it? I decided it would be easier to dig a trench instead of a hole. Easier to get the earth out too with a simple wooden shovel. So I would put a pick on my list. Nice sized small pick, but not 18th century. 18th century picks & mattocks appear to have come in various styles & sizes. Here you can see two small picks that I have collected so far. Both able to be carried without too much effort, & both would double as a weapon. I really can’t see a crosscut saw being carried unless there were some animal to carry it. So that leaves an axe. Many tools can double as weapons if need be. • I gave orders to them to go home and fetch their arms whether guns, swords, pitchforks, axes or whatsoever might be of use against the enemy and for three days provision in their knapsacks” Journals of Conrad Weiser (early 18th century). Post & beam construction is better pegged than tied, & the best tool for making the peg holes is probably an auger. This auger is easily carried tied to my blanket roll along with my half-axe. This one is probably 19th century, but apart from the gimlet tip, it is pretty much the same as an 18th century one. For the gardening a hoe & a small mattock would probably suffice. The carrier/s can decide whether to leave the stails & helves attached or to just carry the tool heads. A modern hoe, but the head is very much the same as they were in the 18th century. A modern hoe at top in an 18th century design, and a small modern made mattock head in period design. Both good finds. You just have to know what you are looking for. What can be carried depends on the transport available, whether just people or if animals are included. Kitchen wares would be needed, sewing kit, knitting needles can be made on site. A spinning wheel is a large item but is easier to use than a drop spindle unless you are used to using one. Brooms can be made easy enough, as can a garden rake. We take so many things about the home for granted, & it is not until we consider moving that we fully realise just how much hardware we have & use each day to make our lives easier & more comfortable. My wife's spinning wheel. This is not a heavy item, and can easily be pulled apart to carry in separate pieces and reassembled later. Not sure on the period of this design. What about smaller tools such as metal files, whet stones, hand vices, rasps. As the list grows we start to see how greater numbers of people will allow us to carry more equipment. More people more security, but also more food needed to feed everyone. A large number of people moving through an area will scare the game away, so hunters must move far ahead of the column. Having been in the position of feeding my family from our garden & by hunting game, I can tell you that the game is not always there to hunt. If I got a buffalo then there was meat for some time if dried, but what I did was share it with my neighbours who also depended on game for food. Even a large buffalo does not last long between several families. Hunting for me was a constant activity, especially when only smaller game was available. Author's shot pouch he made himself. So each family will need to have at least one gun and the accouterments to service that gun. Hunting knives & tomahawks are a must, & I learnt a long time ago to carry more than one knife when hunting. Arms for defence are also very important, so the more you have the better. Each adult member of our group including the women have guns, so they will have to carry their guns as well as any other burdens that fall to them. I find as I get older the heavy packs slow me down & I need to take more breaks. Fortunately I am the oldest in our group, so I will be able to leave the heavier loads to the younger people. Left to right: Light felling axe, two facsine knives or bills, an adze, half-axe, and tomahawk/axe. Not sure on the date of the felling axe. The half-axe and the tomahawk are copies. 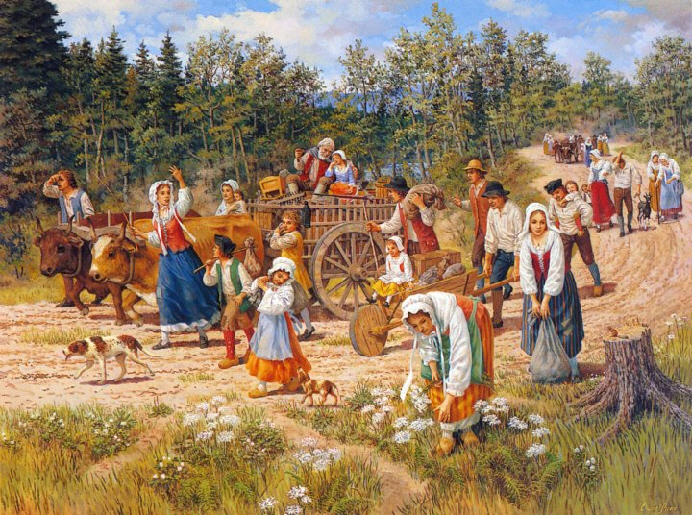 Using a travois would allow a person to carry more weight, but I have not found any documentation to suggest such a device was ever used by white settlers. The downside of using a travois is that it leaves a clear sign on the forest floor that you have passed that way. Horses & cattle also leave clear sign for even the poorest of trackers to follow. The travois I made to be used on foot. This sickle in invalueable for cutting reeds for thatching or making mats. Note the corn cob handle I fitted. The only difference between this modern made pruning saw and an 18th century one, is that the 18th century saw has a straight blade where as this one is slightly curved. Plus of course the screws in the handle. I was amazed at how well this little saw cuts. This is the saw I am using in the video on making a tomahawk helve. My son Laban when he was only a little person. 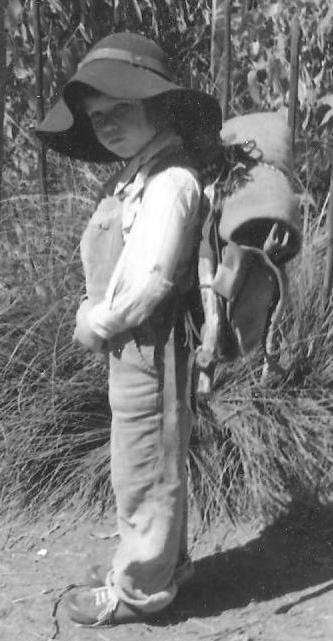 He is using an "A" frame pack frame with a leather pack to carry his gear. Kids like to have their own things, just make sure you don't make the pack too heavy. Some basic camp items should suffice such as a light kettle, a spoon, a knife if they are responsible enough & of course a small tomahawk. My youngest son Kaelem when also a little person. He has his own hunting knife & tomahawk as seen here. Also you can just see Kaelem's fire bag on his right side, which of course holds his flint, steel & tinderbox. 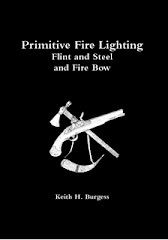 All three of my sons were making fire with flint & steel at a very early age. My tomahawk/axe at top compared to my son's smaller tomahawk when they were children. Now of course all three sons are adults & have full sized tomahawks. Promotional Video For Overseas Group. Colonial Settlers Travel 3. The Skills Needed. The more skills you have, the less equipment you need be dependant on. But what about the skills required to rebuild your life? You have come from a community where item are available to you, be it beg, borrow or steal. But in this new life you have only what you are able to carry with you on your backs or possibly by horse or cattle. You have no furniture, you have no house. You construct a shelter of some description whilst you think on how you can build something better, but what do you sit on, what do you sleep on? How will you construct your fireplace so you can heat water & cook meals? Even constructing the shelter must have been daunting for these ex town dwellers, let alone having to make stools to sit on, plus stails for rakes & hoes, and helves for axes, mattocks & picks. Had they ever used a felling axe? I doubt it, but there were trades skills that some may have had that would have been a great help in setting up a new home or settlement. A carpenter may not know how to make stails & helves, but he does know how to use tools. It is reasonable I think to assume that such a person would take some basic tools with him. A seamstress would find plenty of work making & repairing clothes. She would have little to no experience working with leather for clothing, but she does have to necessary skills & will be able to work it out. Needles & thread are bound to have been included in the list of equipment & tools. It goes without saying that a Blacksmith would have been very welcome. Do not dismiss the skills possessed by the average person, these skills are often discounted but actually count for a lot. Think of all the chores that the average housewife has to do in the running of her home, be it ever so primitive. The labourer too is often gifted with the knack of working things out for himself/herself, & is no stranger to hard work. A poacher from the old country would find his position elevated considerably in this New World. 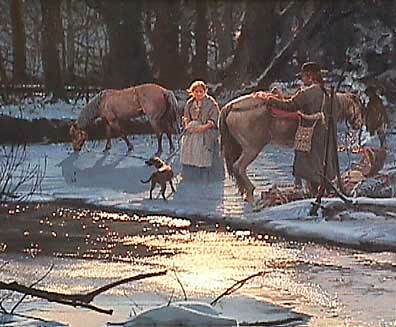 To him/her would fall the job of hunting for food & setting up a trap line for meat & furs. Shop keepers would have organisational skills much needed in a new community, & a farmer or gardener would be beyond price where seed has to be planted for food, & as soon as possible. In the first of these articles I mentioned that a woodsman might accompany these new settlers, of course this woodsman may be a forester or game keeper from the old country, but he will have certain skills that will be very useful in this new place. A woodsman from the old country will know animals in general, & many in particular if not the new ones that live in these woods. He has no doubt trapped rabbit & skinned & dressed it & probably tanned the skin. He will have a knack of making & fixing things because in the old country he would have lived in the woods, as would his wife & children. To these people many of the chores here will not be strangers. He will know how to make stails & helves, how to make charcoal. He will have met with the bodgers in the forests & learnt the basics of building shelters & making chairs. He may even know how to construct a spring lath as I am sure the carpenter will also. In many respects these people were better equipped for life in a new environment that people are today, after all, how many trades people do you know that still do everything by hand? This I guess is where those of us who practice 18th century living history have the advantage, because we practice many if not all of these skills & we only use hand tools to accomplish these tasks. For us it would be second nature to have to live this way if ever we found ourselves in the situation of having to leave our homes & live long term in the wilderness. Something for modern survivalists to think about. 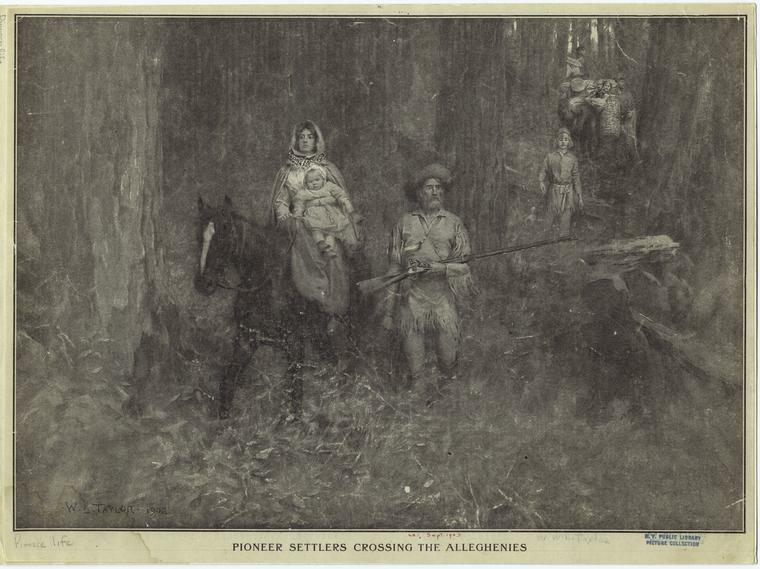 For these woodsrunners moving home in the wilderness was not a problem outside of the dangers involved. They knew what tools were needed, & many of these tools they carried with them all the time. The everyday chores & jobs were second nature to them as they had spent a good deal of their lives living in the woods & farming at the same time. Boone moved several times, every time too many people moved into his area, he would take his family & move on. This quote above gives a very good description of who carries what on the trail. My first instinct was to equip everyone much the same, so that they are all self-sufficient & self-reliant. But obviously this won’t work. There are other tools to be carried, extra lead & powder, water, food, & seed for planting. Members can’t be expected to carry their own equipment plus extras. So where there is a couple, one must be self-sufficient for both of them, if that makes sense. He or she must carry the gun, must carry the shelter for both of them. Each could carry their own blanket, but in general family members need to carry the extras as we can see in the quote above. So the larger the group, the safer you are, & the better prepared you are for long term wilderness living. It has been said that too many in a group could cause problems, but I think this is a modern way of looking at it. They are assuming that only one person is in charge of the whole group. That only one person is to make the decisions in regard to everyone’s duties. I think that there may be one leader in such a group, but families are also a separate group in themselves. Ultimately there will have to be a group of leaders/advisors for the whole community. A council; & I think it would be important to form a militia from group if it was large enough to do so. When you think about it this is the way of the woodland Indians. 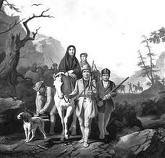 The men generally carry only the basics & the weapons, & the women & children are the burden carriers. This is done for security, & is not a matter of superiority. Colonial Settlers Travel 2. The home Site. A Happy Winter Solstice To All My Readers. Water Bottles, Kettles & Packs. Re sealing My Leather Costrel. A 1954 survival video link at SB's blog. On Our Dining Room Wall. Herbal Medicine & Self-Reliance. PART ONE. One Of My Favourite Paintings. Where Do I Start 2. A Reply From Clarisse. A New Blog. Frontier Partisans. An Interesting Post at Belfast Bushcraft Blog. The Living History Resource Group. Australia. A New Look! Tell me what you think please.